I’m happy to announce that I’m joining David Hadbawnik, Chris Piuma, and Dan Remein as an editor at Eth Press, an imprint of Punctum books and “a parascholarly poetry press interested in publishing innovative poetry that is inspired by, adapted from, or otherwise inhabited by medieval texts.” My poem “Patience” appeared in an Eth press anthology, Cotton Nero A.x, a set of works inspired by the medieval Pearl poet, and I’ve enjoyed hearing David, Chris, and Dan’s scholarly work over the years at the annual International Congress on Medieval Studies at Western Michigan University in Kalamazoo. I’m honored to join them in this endeavor. I’m also hard at work on a unique scribal project of the press, copying by hand fifteen genre scenes, a chapbook by Pattie McCarthy. 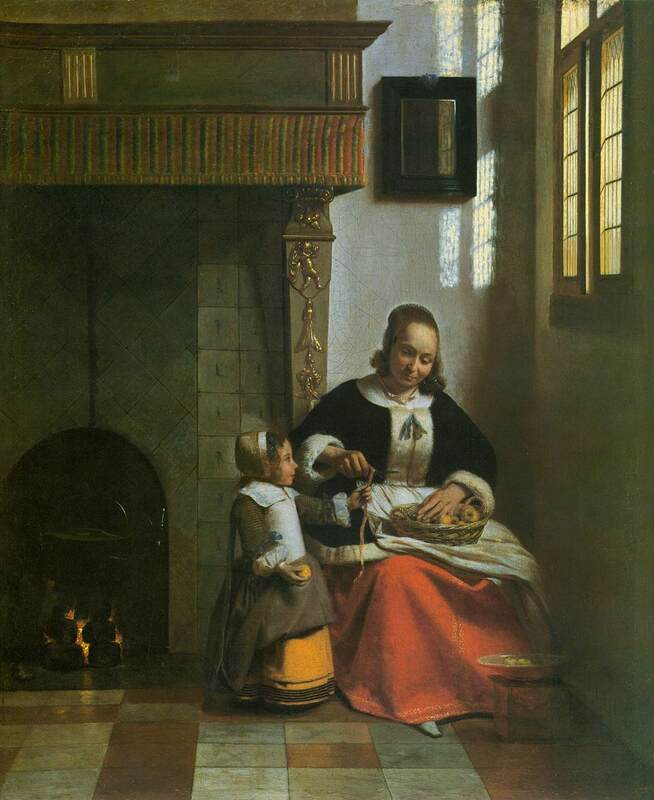 Many of the poems respond to 17th century Dutch paintings, such as Pieter de Hooch’s “Woman Peeling Apples.” It’s interesting to encounter another poet’s poems by rewriting them in my own handwriting; I encounter the language in my own head in a way I’m not used to as a reader of poetry. The project also reminds me of the commonplace books I kept in high school and college, writing down other people’s poems or excerpts, incorporating their language into my cognitive memory. So, if you are a writer with a great project that speaks to medieval texts in some way, please contact me! I’d love to hear what you’re working on. I’m excited to be taking part in the Fall for the Book Festival in Fairfax, VA, in a few weeks. I’ll be reading with two other George Mason University alumni, Matt Burriesci and Alyson Foster, on Wednesday, Sept. 17, at 6 pm in the Center for the Arts on the GMU campus. I can remember attending the earlier (and smaller!) Fall for the Book festivals in the early 2000s in downtown Fairfax and on campus, including an award for Tobias Wolff, a poetry reading by the late Reetika Vazirani, and the hilarity of Julianna Baggott. I’m honored to be a part of the festival and looking forward to revisiting the DC area. Thanks to Rochelle Hurt for inviting me to participate in the wonderful chain-letter Internet crisscross blog tour about our writing processes. Rochelle is the author of The Rusted City (White Pine, 2014). Her work has been included in Best New Poets 2013, and she has been awarded literary prizes from Crab Orchard Review, Arts & Letters, Hunger Mountain, and Poetry International. Her poetry, fiction, and creative nonfiction have also been published in journals like Mid-American Review, Cincinnati Review, The Southeast Review, The Kenyon Review Online, and Image. I finished my second-book manuscript a few months ago, so I’m in that tentative stage of working on new poems, without a formal project yet. So far, the common link is tragedy and the ways we either ogle at it or look away from it because we can’t stand to see it. I’ve been noticing lately that my desensitization to violence is showing signs of strain, and I’m curious about why. It’s hard to say more about the new poems other than that, but I’ll add that I’m also working on a series based on the Luminous Mysteries, a set of meditations that Catholics use while saying the Rosary. 2) How does your work differ from others’ work in the same genre? This is the toughest question because it requires a stronger sense of ego than I’m used to displaying. So much of the writing life is about finding a balance in the ego, in being able to withstand the numerous rejections and still have enough confidence to keep submitting, but also in avoiding excessive amounts of pride or vainglory. That said, my poetry differs from others in that it often incorporates elements of sound (internal rhyme, assonance) without necessarily being formal, that it considers both literary texts from the past and contemporary lived life, and that it both interrogates and buys into the use of the lyric address (I’ll add that I know other poets doing each of these things, though not perhaps all together). Because I can’t write other things. I can’t write a novel at this point in my life (but when I was in sixth grade, I did)! I can’t do plays either (though they were my dominant genre in high school). I’d love to be able to write long meditative narratives like Stephen Dunn or C. K. Williams, but I’ll settle for my little lyrics. I’ve made it sound like a process of elimination, but it’s an active choice, or rather, poetry is what comes to me. I first have to have the germ of an idea; I let it marinate (to mix the metaphor) for a little while; I sit down in a comfortable chair that I use only for reading and writing poetry; I read other poems to fill my well; I write a version in longhand in a notebook; I let that sit and perhaps revise it longhand a few days later; I revise it again as I convert the poem to a Word document; I ask people I trust for their opinions on the poem; I revise again. Repeat as necessary. Lisa Fay Coutley is the author of Errata (SIU Press, forthcoming 2015), winner of the Crab Orchard Series in Poetry Open Competition Award, and In the Carnival of Breathing (BLP, 2011), winner of the Black River Chapbook Competition. Her poems have been awarded a fellowship from the NEA, scholarships to the Sewanee and Bread Loaf Writers’ Conferences, an Academy of American Poets Levis Prize, and have appeared recently or are forthcoming in Kenyon Review, Crazyhorse, Gulf Coast, Best of the Net 2013, and Best New Poets 2010. Manuel Iris is the author of Cuaderno de los sueños (2009) and Versos robados y otros juegos (2003, 2nd ed. 2005). Iris won the 2009 Mérida National Poetry Award and second place in the 2003 Rosario Castellanos National Poetry Award. He is now a doctoral candidate in the Romance Languages Department of the University of Cincinnati. I’m honored to be a part of the June 2014 issue of Poetry magazine! Don Share is rocking the house as editor. In this issue, I’m blown away in particular by Deborah Paredez’s work, as well as Nick Flynn and T.J. Jarrett’s. In fact, it’s a fabulous issue from cover to cover. 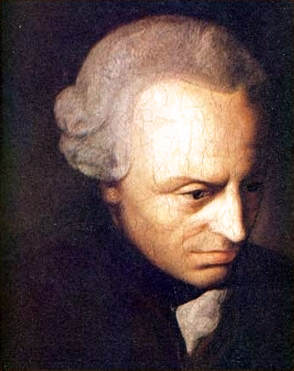 First of all, I’m thrilled that the Kenyon Review Online is featuring a poem of mine, “Kant the Nephrologist,” in their current issue. My apologies to Cincinnati doctor Dr. Shashi Kant, whose name I heard butchered in a medical building check-in line, and to whom I owe the poem’s concept. In addition, last year the amazing Wick Poetry Center at Kent State University animated one of the poems from my chapbook. Here’s a video of me reading the poem to the animation created by a Kent State design student. Lullaby from Traveling Stanzas on Vimeo. I’m looking forward to a different sort of reading this Friday and Saturday (March 14 and 15). I’ll be performing as part of the Cincinnati Contemporary Dance Theater’s Performance and Time Arts series, which brings together music, dance, poetry, and performance. Tickets are $12 in advance, $8 in advance for students and seniors. Though the promo material says I’ll be reading from Full Cry, I’ll actually be reading new work, a sequence of sonnets called “Courtly Love (for Courtney Love),” with a slide show of images projected behind me. I’ve never put together anything like this, so I’m looking forward to seeing how it goes. The sequence itself was inspired by the quizzical looks I got if I didn’t enunciate as I told people that I was researching courtly love for my dissertation. They heard, of course, Courtney Love, grunge-rocker extraordinaire, lightning rod for controversy, feminist icon and object and victim and performer. I joked that I needed to write a sonnet sequence for her. And then I did. It’s been a lot of fun, and the first four sonnets are forthcoming in the online journal Matter. However, poems from Full Cry will be featured elsewhere in the program: Sarah Hutchings, an amazing composer who graduated from the CCM doctoral program last year, has set part of another poem of mine to music. This time it’s “Evening Star,” a poem that is in part ekphrastic and based on this painting by Jean-Baptiste-Camille Corot. I can’t wait to hear what Sarah has done with it! And thanks to Juked for featuring a poem from my second-book manuscript–this one, Preface, appears first and sets the stage. It’s an adaptation of the preface to a 12th century Latin text called De Amore, roughly translated today as The Art of Courtly Love. The author Andreas Capellanus, presumably a cleric, gives “Walter” advice about how to woo women; it’s likely a satirical text, so we have no way of knowing how well it represents the courting technique at the Champagne court in which it was written. (There’s also a crazy section about how courtiers from particular socioeconomic classes should approach women from various classes. Farm girls are fair game, he says.) You can read the original preface, in all its awkward syntax, as translated by John Jay Perry on the eighteenth page of this pdf. It was fun to imagine what kind of advice Andreas would give Walter today. 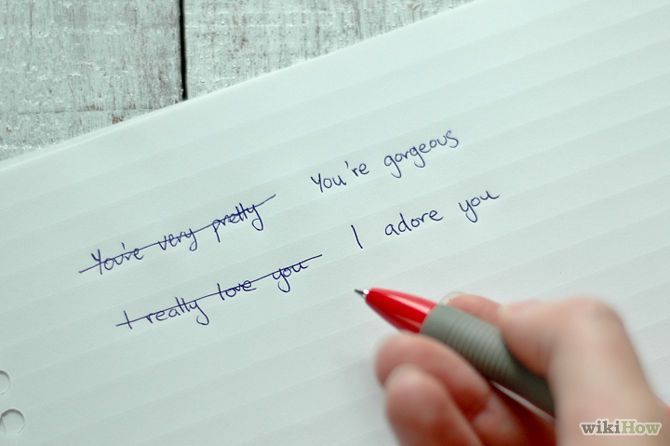 We’re still more than a week away from Valentine’s Day, but I have an early gift for my husband: two different love poems that have received recognition lately. First of all, “Mouth: To Say,” from Full Cry, will be featured on Poetry Daily on Saturday, Feb. 8. Two other poems from my first book have been chosen by the site in the past few years, and I’m eternally grateful to Diane Boller and Don Selby for their support. “Mouth: To Say” first appeared in New South, which nominated it for a Pushcart Prize, and it was also translated into Spanish for a bilingual reading series by Manuel Iris, who noted that the sounds of words didn’t quite work in the same way in the Spanish. Amor doesn’t really start with “tongue against teeth and end on lips” the way the word love does. I was thrilled to be the inaugural interview for the new blog, Speaking of Marvels, a chapbook interview series curated by William Kelley Woolfit. Thanks to Will for the great questions; it was a lot of fun to think back to the choices I made as I worked on I’ve Been Collecting This to Tell You. I look forward to reading the upcoming interviews! There’s other good news about that chapbook, which holds a special place in my heart: Kent State University Press has made it—and the other wonderful books in the Wick Chapbook Series—available for Kindle! If you want to read my poems on a device much thicker than the chapbook itself, now you are able. While you’re at it, check out the Wick chapbooks by Matt McBride, Sarah Perrier, Heather Kirn Lanier, Hugh Martin, and the two that introduced me to the series in the first place: Catherine Pierce and Jason Gray‘s. Readings in St. Louis and Cincinnati! 1. The Observable Reading Series in St. Louis, on Monday, Oct. 14, at 7:30 p.m., at Llywelyn’s Pub in the Central West End (4747 McPherson). We’ll be on the upper floor for the reading. I’m honored to be reading with Ansel Elkins and Erika L. Sanchez. Much thanks to Steve Schroeder (of Anti-) and Stephanie Schlaifer for the invite. 2. Thunder Sky Gallery in Cincinnati (at 4573 Hamilton Ave., just north of Northside, in the same strip as the Comet), on Saturday, Nov. 2. Tessa Mellas, a fabulous fiction writer and fellow UC PhD grad, and I will read from our books, starting around 7 p.m.
Books will be for sale at both events. Looking forward to seeing you there! It’s a great day! My book, Full Cry, is now available on Amazon.com. If you prefer to pay with a check, you can buy it through the website of the National Federation of State Poetry Societies. I also heard last week that a poem of mine will be part of the Out of Sequence project sponsored by Upstart: A Journal of English Renaissance Studies. My poem, called “Weak Constitution,” riffs on the lines “My love is as a fever longing still / For that which longer nurseth the disease,” from Shakespeare’s Sonnet 147. I’m also looking forward to returning as a contributor to the pages of the Notre Dame Review. Much thanks to Orlando Ricardo Menes for picking up two poems from my second-book manuscript. Even more fun news! I’m honored to be part of the 2013-14 Observable Readings series in St. Louis. I’ll be reading on Monday, Oct. 14, at 7:30 p.m. with Ansel Elkins and Erika L. Sanchez at Llewellyn’s Pub in the Central West End. It’ll be good to reconnect with friends and family in St. Louis that weekend. Finally, as a sort of summer wrap-up, I’d like to say thank you to all the great friends I made at the Sewanee Writers Conference last month. Thanks for being such a welcoming group, and thanks to the staff who worked so hard! I loved getting to hear what my peers were working on–as well as what the greats are up to. Readings by Robert Hass, Tim O’Brien, A.E. Stallings, Claudia Emerson, Mark Strand, and many more bowled me over–and in some cases, brought me to tears. 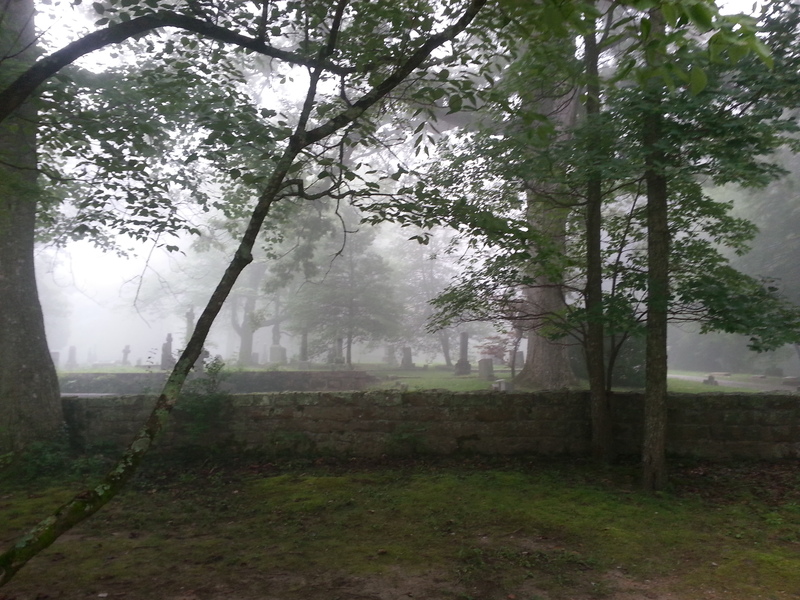 The picture here captures the last morning there, when fog shrouded the graveyard where Allen Tate is buried.